There's nothing more frustrating than stamping an image and not getting full ink coverage. We're here to unlock some expert advice on How To Get a Solid Stamped Image with Clear Stamps! Today's video will give you tips on prepping your clear stamps for the best ink coverage. Stephanie shares great ideas to do just that! You'll never get a blotchy image again (well, we can't guarantee that, but this video sure will help)! Watch the video below or click here (MFT Tips & Tricks | How To Get a Solid Stamped Image with Clear Stamps) to watch it on YouTube. Don't forget to subscribe to our YouTube channel so that you don't miss a single tutorial! I'm not going to lie, I really needed to watch that. Now you and I can be expert stampers, too! This is just one of several videos in our Tips & Tricks Playlist. Check out the other videos HERE for more great ideas! Let's take a look at a few examples of some projects that feature crisply stamped solid images. 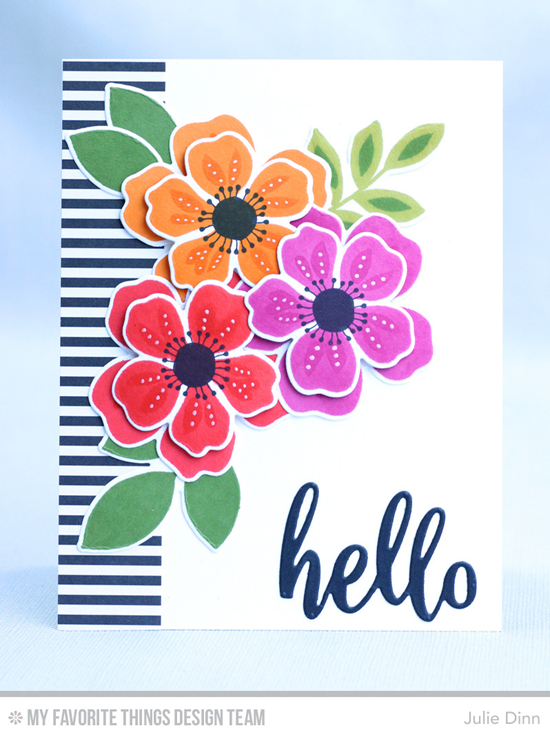 Julie achieves amazingly crisp images with vibrant ink colors using the Flashy Florals Card Kit. While the kit sold out in a flash, these stamps and Die-namics will be available in a future release, so stay tuned! 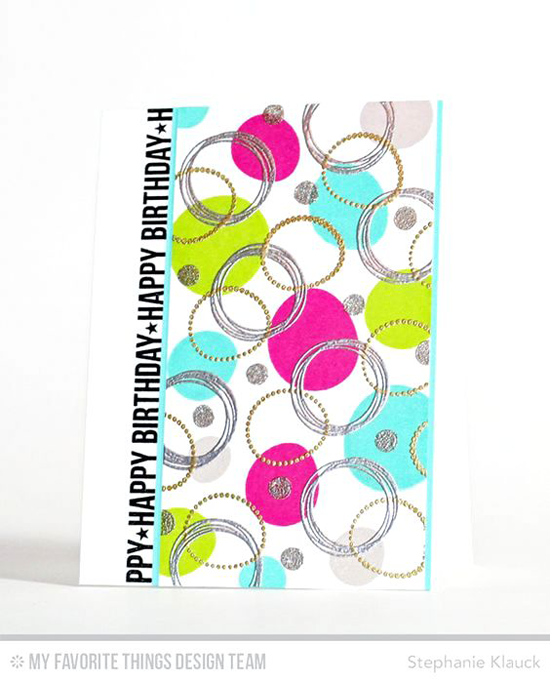 Stephanie creates a party in card form with the Party Patterns stamp set. Look how awesome those solid circles look. What a pro! Our layering stamps often come with solid and detail stamps, so it's important that the solid image stamps perfectly. 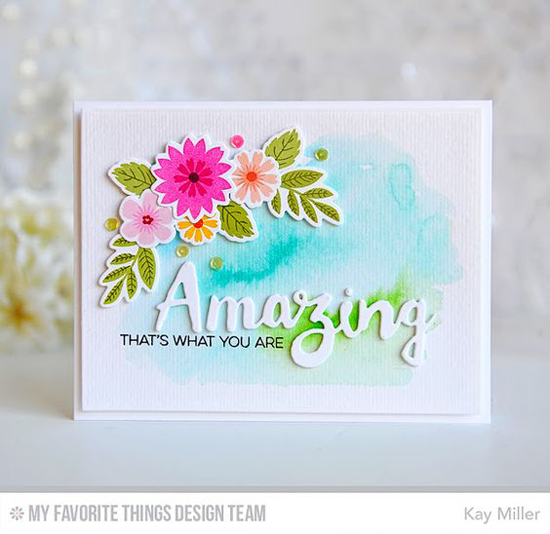 Kay rocks the Mini Modern Blooms stamp set and achieves solid stamping gold medal status! You will LOVE trying these techniques for prepping your stamps and be thrilled with the results. Be sure to tag #mftstamps when you post your projects online. We can't wait to see what you've made! Great tips today. I love your bright fun cards. I've run into this problem before and thought it was the ink formulation. Really appreciate these tips!